College: Art Haege started at tight-end and defensive-end for St.Ambrose College in Davenport, Iowa in the late 1950's. He was the school's Athlete of the Year his senior year in college and was All-American honorable mention in football. Art Haege was Inducted into the St.Ambrose Hall of Fame in the 1990's. Art Haege was also a regional champion in Golden Gloves boxing and he played one year of semi-pro baseball for the Holland Dutchman in Holland Michigan when he was 19. High School: Art Haege went to Peoria Spaulding (now called Notre Dame High School) in Peoria Illinois where he started on the football and baseball teams. 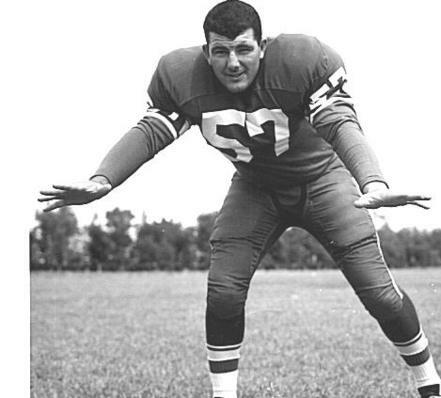 Pro: Art Haege played two pre-seasons with the Boston (now called New England) Patriots in 1960 and 1961 where he was listed #2 on the depth chart at middle linebacker. (see the pic on the right from his game program, Haege #65). The Patriots only kept 35 players and 3 linebackers on their roster back then and he was the last player to be cut from the team in 1961. The head coach of the Boston Patriots was Lou Saban, who gave Coach Haege his start coaching in the Arena Football League. Coach Haege then went on to start one season with the Chicago Bulls (before they had the basketball team) of the Continental Football League in 1961. Coach Haege then played for the Saskatchewan Roughriders of the CFL in 1962. Coach Haege injured his shoulder early in the season that ended his playing career. Art Haege's first coaching job was the head 9th grade football coach at Gordon Tech High School in Chicago Illinois in 1962. 1963: St.Ignace Michigan- Assistant varsity football coach. 1964: St. Ignace Michigan- Head Football Coach. Record: 6 and 2 and conference champions. They didn't have State playoffs back then. 1965: Manistee Michigan- Head Football Coach. Record: 5 and 3. 1966: Northern Michigan University- Graduate assistant, defensive backs coach. 1967: Two Rivers Wisconsin- Head Football Coach. Record: 7 wins, 1 loss and 1 tie with a team that had not won more than 2 games per season the previous ten years. 1968: Two Rivers Wisconsin- Head Football Coach. Record: 8 and 0 and conference champions. Ranked #3 in the State of Wisconsin, big school division. They didn't have State playoffs back then. 1969: University of Wisconsin-Offensive Line Coach. Wisconsin had a 22 game conference losing streak entering the 1969 season. Coach Haege took the entire team to church the day before the Iowa game.The next day, Wisconsin defeated the University of Iowa to end Wisconsin's 22 game losing streak on Oct. 11th, 1969. With Coach Haege on their staff, Wisconsin won 3 conference games. They defeated Iowa, Illinois, and Indiana. Art Haege when he played for the Saskatchewan Roughriders of the Canadian Football League in 1962. 1970: Traverse City Michigan- Head Football Coach and Athletic Director at Traverse City St. Francis High School. Record: 6 wins and 2 losses. At St. Francis Coach Haege defeated his previous team, St.Ignace Michigan, 48 to 14. We had that game ball on our living room mantle for many years. 1971: Virginia Minnesota High School- Head Football Coach. Record: 4-4 and 1 with a team that had won only three games the prior three seasons. Coach Haege guaranteed a win before his very first game as their new head coach in front of the entire school at their school pep rally and assembly the day of the game. Good thing Coach Haege's team won 22 to 12. 1972: Virginia Minnesota High School- Head Football Coach. Record: 6 and 3. This team was 5 and 0 until their starting QB got hurt. 1973: Virginia Minnesota High School- Head Football Coach. Record 8 and 1. This is Virginia Minnesota's best team ever. The only game they lost was to Eveleth Minnesota, who went on to win the State Championship. 1974: Virginia Minnesota High School- Head Football Coach. Record: 8 and 1. After the season Coach Haege was named the Iron Range Conference Coach of the Year along with numerous other coaching awards. 1975 and 1976: Virginia Minnesota High School- Head Football Coach. Record 5 and 4 and 4 and 5. You might beat Coach Haege's team because you had better athletic talent, but you better buckle up your chin strap because Coach Haege's teams were always fundamentally sound and hard hitting football teams. Coach Haege's ongoing feud with the Administrators at this school, despite him having the best teams this school has ever had, caused Coach Haege to leave.The Administrator's at this school didn't deserve a Coach like Art Haege! Coach Haege was always the most popular coach and teacher in school. 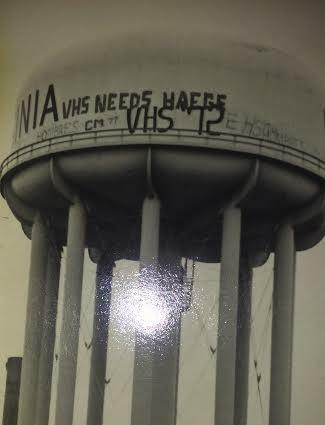 The students at Virginia High School in Minnesota wrote "VHS Needs Haege" on top of the city water tower after Coach Haege left after the 1976 season. 1978: Hibbing Community College in Minnesota- Head Football Coach. Record: 5 and 4 despite the school not even having a team the season before. Coach Haege's Hibbing team beat Mesabi Community College of Virginia Minnesota, who had an undefeated record of 7 and 0 at the time, 7 to 3 on the last game to ever be played on the same football field that Coach Haege coached on when he was Virginia Minnesota's High School football coach. This game showed Coach Haege at his finest coaching that night! Coach Haege had revenge in his eyes, going back to his old football field and getting the upset win! Coach Haege's Hibbing team did their pre-game warm up on a high school football field 20 miles from town, and waited 1 minute until the game started and walked on to the game field and right through Mesabi Community College's pregame warm up. It was like the Ali vs.Foreman fight and Ali won! The greatest football game I have ever seen! Fittingly, the winning TD pass for Coach Haege's team was thrown by Don Palmer from Stambaugh Iron County High School in Michigan, and the pass was caught by Brian Wiess, who played high school football for Coach Haege in Virginia Minnesota. Coach Haege ran nine minutes off of the clock in the 4th quarter, chewing up first downs, by giving the football to his fullback, Jim Fish of Milwaukee Wisconsin, to seal the win. Coach Haege's Hibbing team carried Coach Haege off of the field on their shoulders in victory. 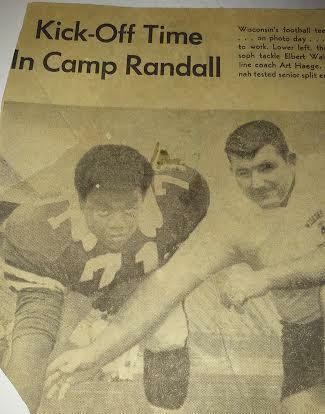 Art Haege when he was the Offensive Line Coach at the University of Wisconsin in 1969. 1981: Biwabik High School in Minnesota- Head Football Coach. Record: 5 and 4. Coach Haege liked moving from school to school, because it was a challenge to take a group of players and make them into a winning team. 1983 and 1984: Assumption High School in Wisconsin Rapids Wisconsin- Head Football Coach. In 1983 Assumption finished the regular season 6 and 3 and made the State playoffs for the first time in 10 years. During the regular season Assumption was the only school to score on the eventual State runner up, Lacrosse Aquinas, losing to Aquinas 14 to 6 during the regular season. 1986 and 1987: Vermilion Community College in Ely Minnesota-Offensive Coordinator. Head Coach was Rudy Semeja. Record: Conference champs in 1986 and 1987. In 1986 Vermilion finished with a record of 11 and 1 and won its first Community College State Championship in the schools history. 1990 and 1991: Westmar College in Lemars Iowa- Defensive Coordinator. The 1990 team was 9 and 1 and Coach Haege's rushing defense was top 10 in the nation among NAIA colleges. 1994: Milwaukee Mustangs of the Arena Football League. Defensive Coordinator. Lou Saban (who coached Coach Haege when he played for the Boston Patriots) was the Milwaukee Mustangs head coach. Coach Haege became the interm head coach during the middle of the season. 1995-2001: Iowa Barnstormers of the Arena Football League. Defensive Coordinator, Line Coach and Player Personnel Director. In the fall of 1994 before the spring Arena Football season in 1995, the Iowa Barnstormers of the Arena Football League hired Coach Haege to start their new Arena Football team. He was the first coach they hired before they named a head coach. Coach Haege focused on his player personel duties of recruiting talent for the team before their very first season in 1995. In 1995 and 1996 the Iowa Barnstormers played in two Arena Bowl Championship games. NFL QB Kurt Warner played for the Iowa Barnstormers in 1995, 1996, and 1997. 1989: Head Coach for an American Semi-Pro Football team in England. 2006: Defensive Coordinator for the Arkansas Twisters of the Arena Football League. 1995: After his first season with the Iowa Barnstormers in the spring Arena Football season of 1995, Coach Haege was named the Head Football Coach of the Minnesota Fighting Pike, a brand new team in the Arena Football League that was to start play in the spring of 1996. But Coach Haege suffered a serious brain stroke in November of 1995 that effected his speech and he wasn't able to be their head coach and he stayed coaching with the Iowa Barnstormers.